What is the meaning of the woodman on the back of the drum? IN some areas of the Siberian Republics, drums will have a figure added to or incorporated in the grip as a symbolic representation of the spirit of the drum. In my rendition of one of the basic styles ( done on a Remo) I used a full figure, and did the “arms”/cross member in a way that would easily allow the addition of jingles or ribbons. This drum is actually a combo, with the rigid arms having a hard attachment to the frame, and the main body having a corded attachment at the head & feet. It was done as an experimental piece. 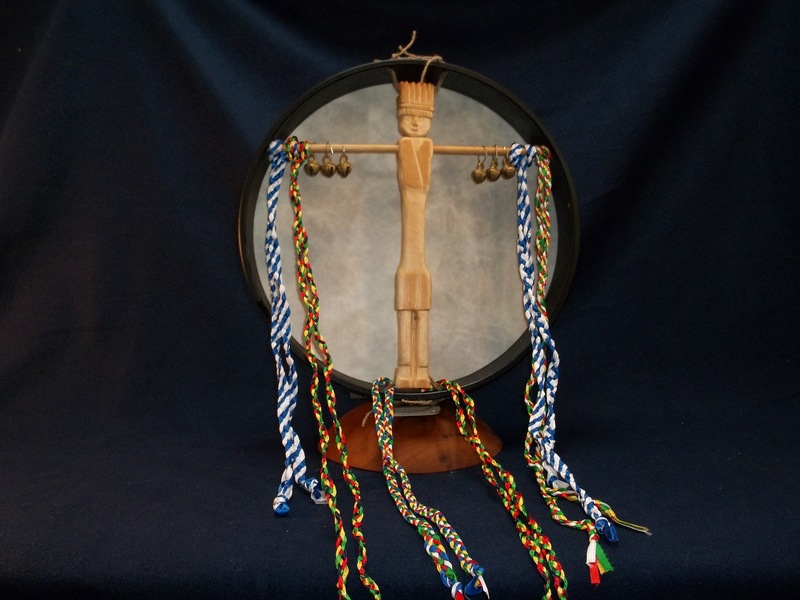 the person who purchased this drum ( without the ribbons and jingles) is a professional drummer who collects drums. my main personal drums have what I call “howlers” – open mouthed anthropomorphic heads on each of them- the larger drum has the larger figure- I contoured the grips to fit my hands.